For those who love a traditional beachside holiday, Hotel Gemma is just over a kilometre from both Ischia beaches and the beaches in Casamicciola Terme. 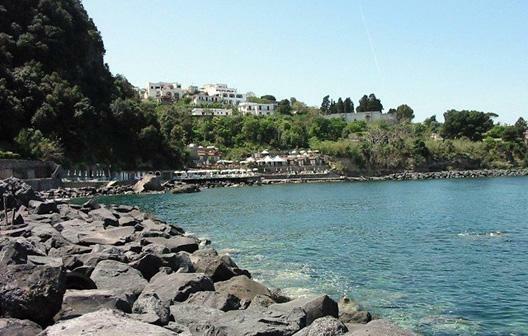 English beach and Lido beach are in Ischia, then in Casamicciola you will find Perrone beach or continue up to Suor Angela, you’ll be spoiled for choice. Maronti beach in Barano and the excellent beaches of Chiaia, Cava and Isola in Forio are a little further away, favoured by younger beach-goers. The small Bagnitiello bay is very little and can be reached via a path to the sea. In this beautiful bay you can bathe in a natural hot spring. Bagnitiello is an extraordinary resource waiting to be discovered, a real gem, a fascinating and evocative natural wonder. It is a small basin formed by stones, creating a veritable pool filled with naturally heated thermal water which is rich in extraordinary healing properties. The Bagnitiello is a very nice area of ​​the seaside, especially with its hot spring water pools that flow directly into the sea. Experience the Ischia beaches; relax on the rocks, take a bath in the hot springs, watch the waves glinting in the sunshine, enjoy experiences that give a sense of well-being and a wonderful feeling of harmony with nature. The early history gives this lovely bay mythical origins dating back to Acmeno, son of the nymph Euplea. The same ancient myth recognises the extraordinary healing properties of these waters, especially for those suffering from tinnitus or hearing loss. Bagnitiello bay is characterised by a pebble beach and has the ability to offer both free stretches of beach and areas in state concession and therefore with an entrance fee. In particular, the area dedicated to free use is a cliff that overlooks English beach.